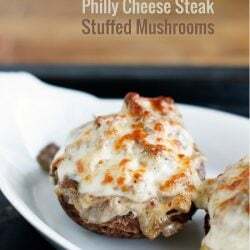 The whole family will love this super easy recipe that is loaded with beef, onion, and cheese! Gluten free, low carb, and keto friendly! Combine the sliced onions, butter, garlic powder, salt, and pepper in a medium saute pan. Cook over medium heat until the onions are soft and starting to brown. Meanwhile, place the mushroom caps upside down on a paper towel-lined plate and microwave on high for 3 minutes. Turn mushrooms over and microwave for another 2 minutes. Add the beef to the onions and cook for 2 minutes. Remove from the heat and stir in the mayonnaise and mustard – stir well. Stuff the mushroom caps generously with the beef mixture (about 1/2 cup per cap if making four large ones), then top with a slice of cheese. Broil for 2-3 minutes, or until the cheese is browned and bubbling. Serve hot. Alternatively you could bake for 15 minutes at 375 degrees (F) or grill them over indirect heat with the cover down for about 6 – 8 minutes.